You studied with the legendary Ferenc Rados. How was he as teacher and person? Rados is the best piano teacher. To me he was the most important one. It wasn’t easy. On the contrary, I cried a lot but never gave up. For years he criticised me for everything, nothing was ever good. He was sarcastic and even cynical, but deep down he had a heart of gold. And he was always right. And what were the most important lessons? From Rados I learned the main elements of piano playing, tone production and self-control. How to listen to myself and how to practise well, without wasting time, always musically, never mechanically. He could show it all on the piano – he is a very great pianist. You also studied with another famous Hungarian, György Kurtág. What kind of influence did he have on your playing? Kurtág was the other main influence on my playing following Rados. I came to him at the age of 14. He was very analytical and interested in the tiniest details of the piece. He is also a wonderful pianist and it was marvellous to hear him demonstrate on the instrument. Of course, Kurtág thinks and feels like a composer, and I think that is a much higher level of musical understanding. 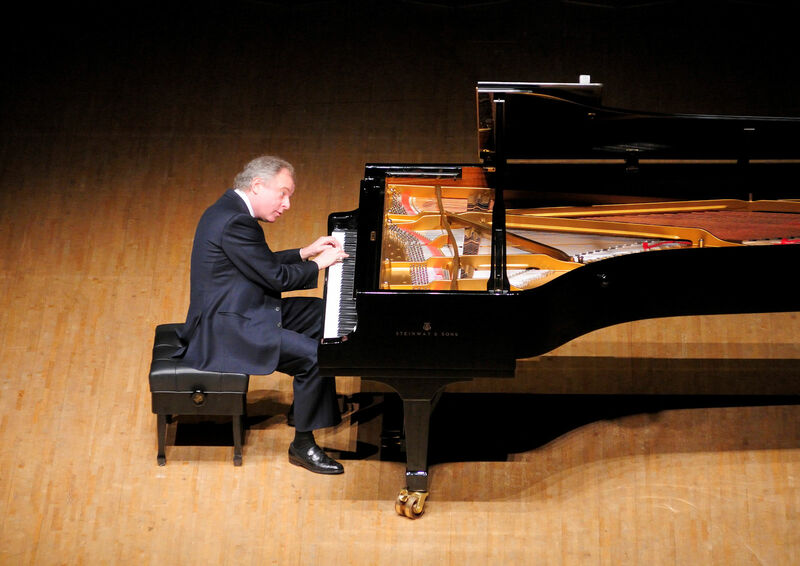 Which pianists past and present do you admire? Many, especially of the past. Schnabel, Edwin Fischer, Cortot. But also Rachmaninov, Friedman, Hofmann. Annie Fischer was very important in my life, I heard her so often and later we became close friends. Then Rudolf Serkin and Mieczysław Horszowski. Of today’s pianists, Radu Lupu, Murray Perahia, Richard Goode and Peter Serkin. Bach has obviously been a lifelong friend. What qualities touch you in particular? There are several great composers but Bach stands‎above everyone else, there is no question about this. Spirituality is the first word I would mention, the perfect harmony of emotion and intellect. He is like a great scientist who systematically sets himself new challenges and solves these on the highest possible level. With Bach we also have the unique combination of the sacred and secular – his cantatas and passions contain dance movements, while instrumental works, like the Well-Tempered Clavier include pieces that could be parts of the Passions. Is it true you’ve committed all of Bach’s works to memory? How have you achieved this and what has it accomplished for you? Not all but certainly the most important keyboard works. Having a good memory is a matter of good luck, either you’re born with it or not. Nevertheless, it takes an enormous amount of time, patience and discipline to learn such complex music by heart. Let me emphasise, playing from memory is not a circus act as some people like to suggest. For me it is essential to close my eyes and open my ears and heart so that I can communicate the composer’s message. For people who play from the music it is hardly a matter of choice. Many pianists are very good sight-readers and can fearlessly read anything, however I would not call this interpretation and it cannot be compared to a performance that is based on decades of serious study and work. In the past you’ve described Beethoven as a ‘hard nut to crack’. What is it about his works that challenge you? Beethoven’s works are so different. Some are dramatic and heroic, some lyrical and tender. Others are incredibly humorous. It’s therefore an enormous challenge for one pianist to find the right character for each piece. You’re playing two Beethoven sonatas with Musica Viva – No 24 and 26. What do you see in each of them, and what distinguishes them from each other? No 24, the F Sharp Major sonata, was Beethoven’s own favourite. This is a very unusual key and the work is very personal, very lyrical, almost Schubertian. He wrote it for Thérèse von Brunswick [one of his students] and it could be a love poem to the “Immortal Beloved”. Les Adieux is very different. It’s the only Beethoven sonata with a ‘program’, three movements entitled ‘Farewell’, ‘Absence’‎and ‘Return’. It was written for his friend and pupil the Archduke Rudolph who had to flee from Vienna because of Napoleon’s troops invading the city. While the first work is a very intimate sonata, Les Adieux is a real concert piece, brilliantly virtuosic. You have talked in the past about certain composers either being generous or a bit narrow in the choices they give players. Can you elaborate on this idea, perhaps in relation to Bach and Chopin? Apart from the notes themselves Bach wrote very few instructions in his scores, with almost no tempo indication, no dynamics, phrasing or articulation marks. In these the player has huge liberties – she or he has to fill in the gaps but of course with a sure knowledge of the style and always with good taste. Chopin, on the other hand, has been meticulous in his notation, even in his pedalling. He wanted to make sure that pianists follow his instructions. Sadly this is not the case – there is hardly any another composer who has been maltreated by performers like Chopin. Why? Because of ignorance, because pianists feel that in ‘Romantic music’ anything goes, that tempo and rhythm are unimportant. The opposite is the case. Rubato must be applied sparingly and within the limits of good taste. How do you approach the emotional world of Schumann’s Ghost Variations? This is Schumann’s last composition written at the time of his attempted suicide and before his final years at the asylum of Endenich. It’s therefore a very profoundly moving document. The challenges are definitely not technical. He was writing absolute music that has nothing to do with any specific instrument. This work is very private, like a confession. Thus it feels very strange to me when people applaud after the final notes, what is there to applaud for? Are there composers you have a fondness for that you would like to play more? I would like to play Debussy more often.